Steed of shadows was in the ring. Having played Shanes list which is a lot like this I knew how hard it could be, with 2 siren songs and up to -5 Ld from the banner and Masque I thought I’d have some problems. 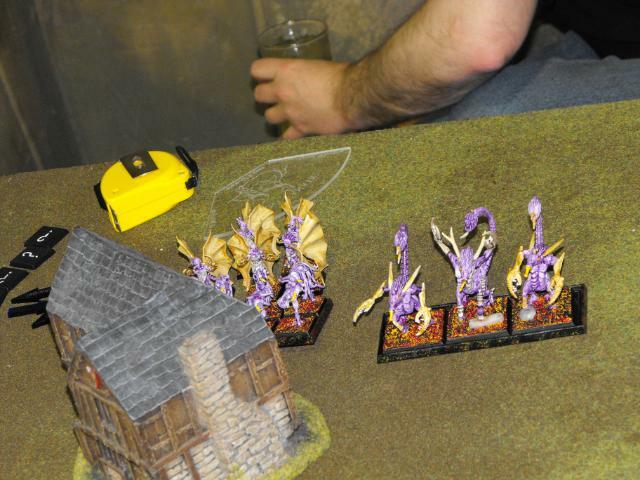 But I was grateful he only had 1 unit of flesh hounds. 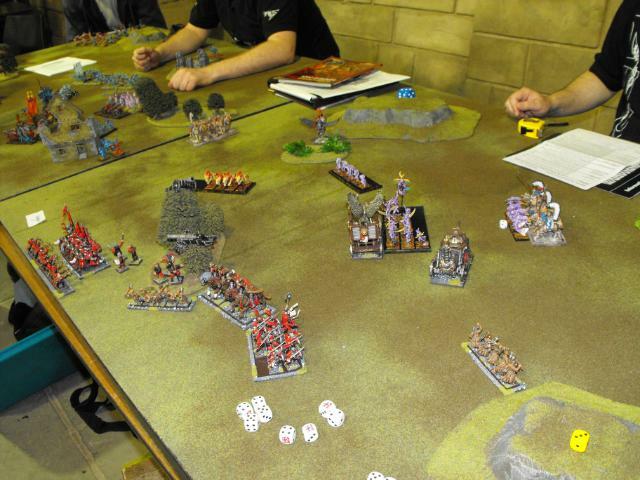 I used the wood in my deployment zone to bunker around with the plan being get the war altar into keeper, the stank [Ed. 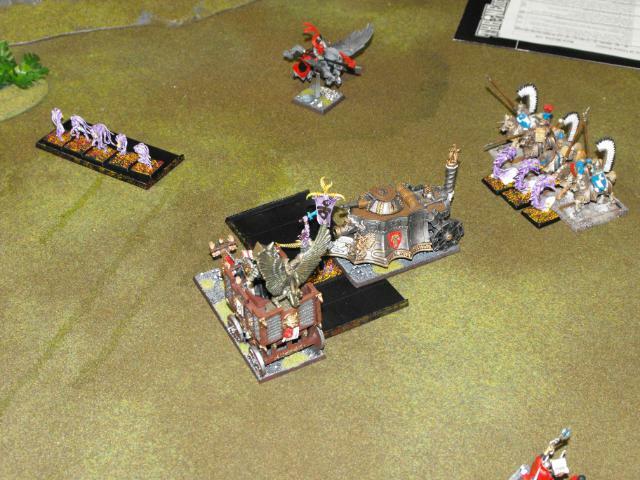 Steam Tank] into the daemonettes and use the knights to screen the flamers. Both my outriders and pistoliers started the game facing backwards to avoid being siren songed (a trick I’d picked up practicing against Shane). Mark got the first turn then spent a long time deciding if he should ran as fast as he could at me or to take his time, in the end he decided to some straight at me and use the keepers siren song in my turn 1. Apart from his aggressive movement phase not much else happened. 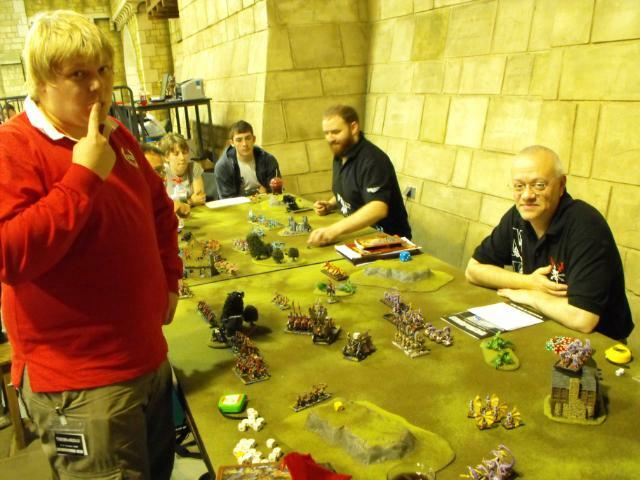 In my turn 1 he used the keepers siren song on my red knights so I sent them in and charged the war altar in as well. I moved my other knights up in the flamers face and the steam tank headed for the daemonettes. The peg captain tried and failed to nick a spell from the horrors and the 2 units of free company ran off to re direct the fiends and flesh hounds while the pistoliers lay in wait for the hounds. In the magic phase I killed the Masque with a burning gaze and the cannons did the odd thing. Combat saw the lector challenge and not pass his Ld to hit the keeper, I won combat but not much happened to the keeper. Well this turn Mark turned his first turn mistake into a massive brain fart (I’ll explain shortly). He charged his daemonettes into the flank of the war altar and the furies into the steam tank to pin if for a turn, this flesh hounds also charged the free company who fled. He moved the fiends around the hill and the flamers past the knights. Nothing happened in the magic phase and the flamers failed to kill a knight. In combat the lector failed his Ld test again and Mark won combat now was the time for him to reveal his mistake, the knights fled due to combat res but because the war altar is unbreakable it didn’t go anywhere. 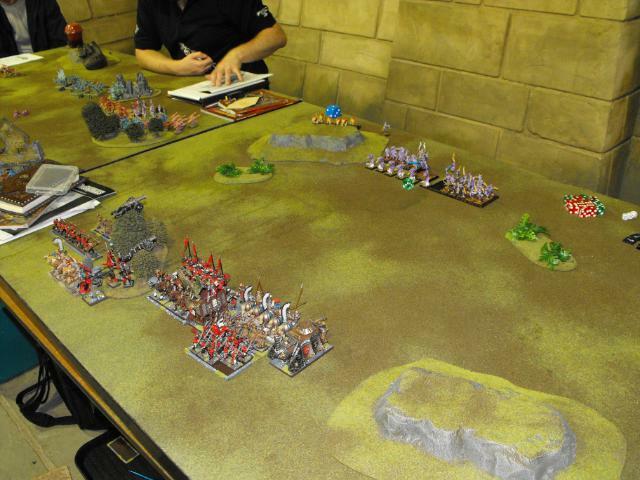 Mark had completely forgotten this and had put the unit in to give more combat res to break the war altar totally forgetting it was unbreakable and now he had his daemonettes pinned with no real chance of them going anywhere. At least the knights panicked the cannon and crossbows. In my turn everything rallied and I moved the pistoliers to the flank of the flesh hounds the free company on the right blocked off the fiends and the knights turned around to face the flamers. In the magic phase a cleansing flare from the war altar killed a fiend, some furies, a flamer, some daemonettes and the keeper of secrets. In the shooting phase the cannon that could fire misfired but was ok and shooting took out the last fiend and another flesh hound. 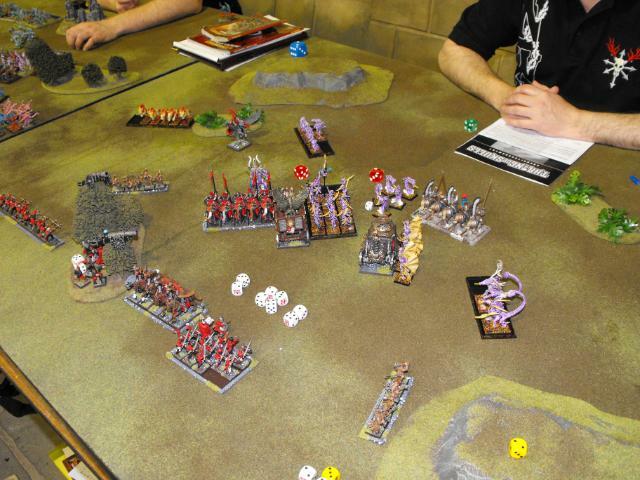 Combat saw the lector fail his Ld test to attack the herald in the challenge and the steam tank ran over the furies. 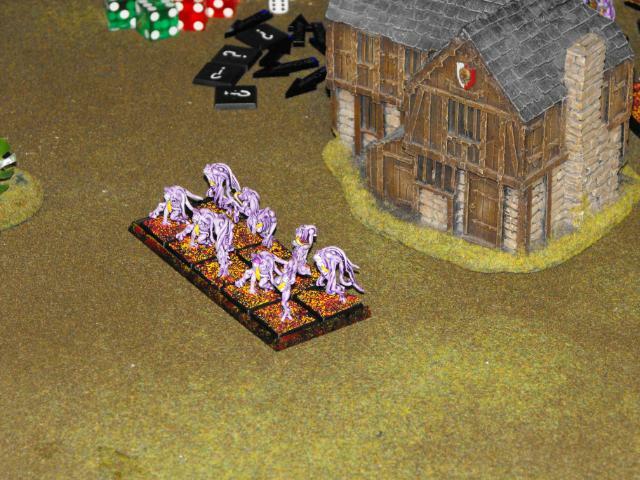 Marks flamers charged the Knights who were stalking them, the flesh hounds pushed on and the horrors jumped out the building to see if they could help. 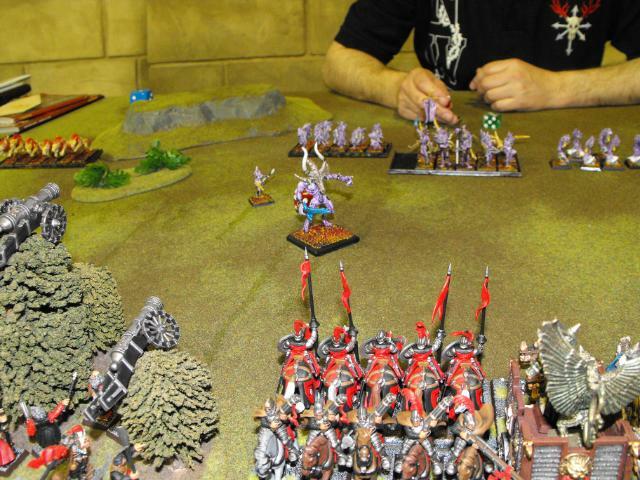 In combat not a lot the knights showed how good a 1+ save is and won combat killing a flamer in the process. The lector didn’t want to attack the herald again so nothing much happened there. In my turn the steam tank made for the rear of the daemonettes and my red knights moved to block off the flesh hounds. My free company headed for one of marks table quarter and the pistoliers continued to stalk the hounds. Magic cleansing flared some more stuff and by the time the tank finished the poor herald was on his/her own. I think it was at this point Mark shook my hand and we started to add up points (I can’t be sure though as memory is going a bit so if I’ve got it wrong I apologise Mark). 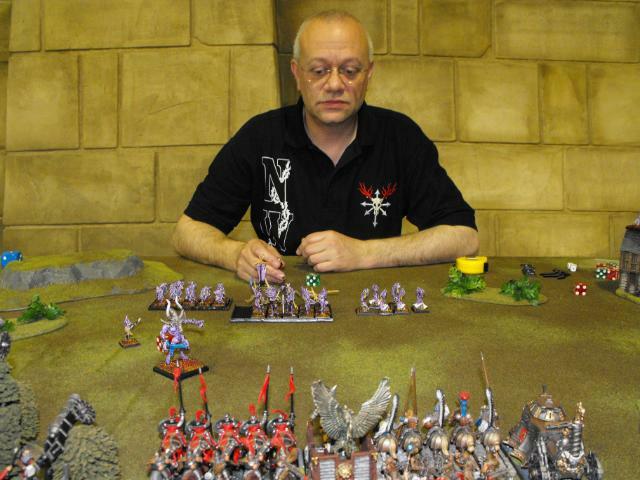 I think Marks big mistake with the war altar cost him the game in the end but I was very happy with my Empires performance and everything seemed to go very well, I really do think Empire can give daemons a run for their money if used right. Once again Mark was another pleasure to play against and always is.